It’s been a cool, dark, damp, and windy day – the perfect background for cozying up to a pile of school homework. I attacked mine with a vengeance all day long, and ended the afternoon feeling like I had made some good headway. My gurgling stomach led me to the kitchen. And here’s what I rustled up for dinner. Yup. It tasted as good as it looks. For starters: simple roasted salmon with sea salt and lots of cracked pepper. 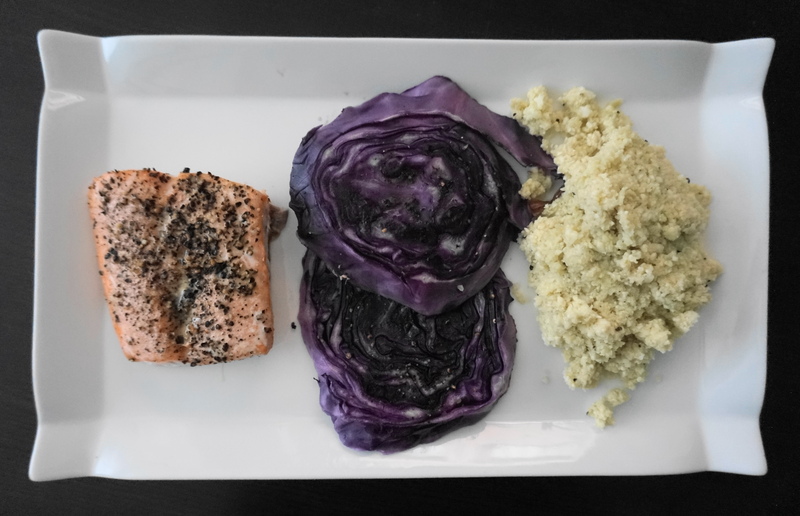 Alongside the salmon on the baking sheet, I placed a few thinly-sliced red cabbage wedges drizzled very lightly with coconut oil. Into the oven went the baking sheet, for 30 minutes at 350 degrees. And the surprise – cauliflower rice! I chopped up about half a head of cauliflower and gave it a whirl in the food processor until the mixture resembled grains of rice. I dumped the rice into a large bowl and stirred in sea salt, freshly-cracked pepper and a couple of tablespoons of nutritional yeast (use grated Parmesan cheese if you prefer a dairy option). I warmed a large skillet, added about a teaspoon of coconut oil, and poured in the cauliflower mixture. I stirred until warmed through. Ready in 5 minutes. This meal warmed the cockles of my heart. Looks amazing!! So you did not cook the califlower before you put it in the processor. I have read recipes where they steam it first….cannot wait to try this all for dinner! You’re very welcome. Come back again! You’re very welcome…thanks for stopping by! Thanks for stopping by…please come back again!